Developer Jack L. Thornton Jr.
Musician Jack L. Thornton Jr.
6.71 points at 14 votes (rank 430). 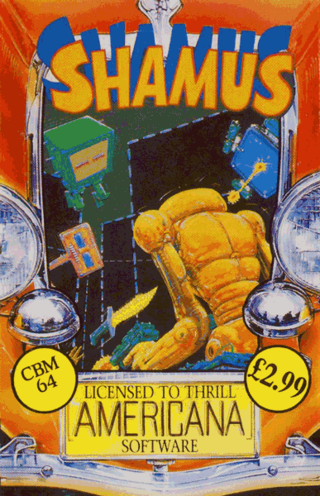 Shamus is an actionadventure by Synapse Software which was ported for the C64 in 1983. 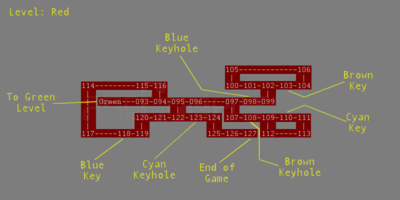 You need to search the labyrinth-like complex for keys and locks and by this open new parts of the map. The aim of the game is to reach the villain "Shadow", which lurks for the player. Hordes of enemies and electric walls confront the player with nearly unsolvable problems. 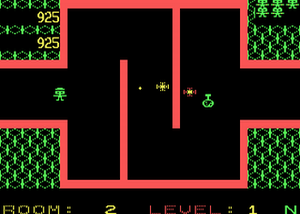 The game is a consistent continuation of the arcade hit "Berzerk". You've finally made it. Your nerves and your guts tell you he's here... and the smell. The sickeningly sweet ordor of decomposing fruit; the SHADOW's trademark. Now all that's left... to find and destroy him before he returns the compliment. You didn't know it was going to be this hard. After all, it is the 21st century and your ION-SHIVS are probably the most dangerous weapons in this part of the galaxy. They can drop a fully screened sniffer-droid at 300 meters! Out of the corner of your eye, a small black shape darts up to the door and noiselessly enters the builing across the rocket pad. The memory of your last encounter with the Shadow jolts you, like a neuro-stunner set on max. Images of ROBO-DROIDS, that just don't know when to quit... dark, sneaky WHIRLING DRONES from a timeslip star system... and the lightening quick SNAP-JUMPERS, that fry you for looking at them cross-eyed, flicker through your mind. Still you've handled them before... The big boy himself, SHADOW, is the one you're after! 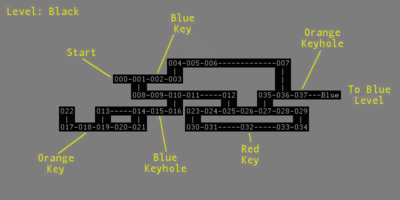 As you silently enter the door coordinates into your teleporter, the scanner indicates that there are four colored levels of 32 rooms each, and every room is bristling with danger. You know it won't be a high school prom when you transport into the Shadow's lair, but there is no turning back. So with a grim chuckle, you reach for the bottle of Nervo-Stim and energize the transporter. You're ready as the Stim slides down warmly and your biosensors click into high gear! TELL THE SHADOW THAT SHAMUS IS HERE! The first room does not arouse even the faintest suspicion to what a whopping task lies before you. To successfully play through Shamus, (which is theoretically (!) 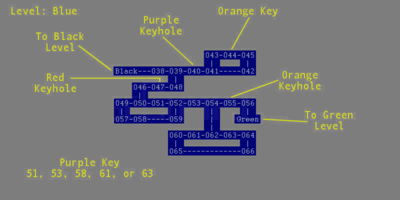 possible) the hero of the game needs to be guided through 4 levels with each 32 rooms and unlock new sections with the help of keys, where again he has to find new keys and locks. The levels are named after colours: black, blue, green and red. In the last room of level "red" the Shadow waits for Shamus. The rooms are guarded by a random number of enemies that rises during the course of the game and after reentering the room it is filled up again. The walls contain high voltage and must not be touched. The game has four difficulty grades (Novice, Advanced, Experienced and Expert) as well as four versions of the original map, that carry the names of secret agents and detectives (Marlowe, Cluseau, Holmes , Bond). 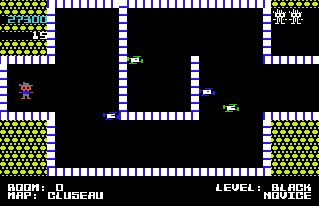 The player controls the Shamus (US slang for "sniffer") through the labyrinth. He can walk into all directions and fire his ION-SHIVS (Short High Intensity Vaporizer) and starts the game with five screen lives. Contact with the electrically loaded walls, enemies and their missiles, as well as with the Shadow are deadly for him. Shadow is the chief villain of the game. If Shamus needs too much time to cross a room, shadow will materialize in a corner - accompanied by a threatening hum - and try to chase Shamus. As he carries "Tri Gamma" armour, Shamus can at most lame him for a short time. Robodroids and Drones form most of the enemies. At first you meet them only sporadically, but in the later course of the game they appear in hordes. In the eagerness to destroy Shamus, they occasionally shoot each other. Shamus can neutralize their shots with a shot from his own ion blaster. Snap Jumpers are the most dangerous enemies in the game. They are very fast and try to reach Shamus with big jumps and destroy him. He has often only a split of a second to avoid this. Extra Life Potions are the only possibility to get a bonus life in this game. Question marks either give a bonus life, bonus points or call up the Shadow. 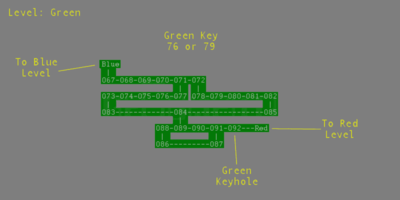 Keys and locks have colour codes and are scattered through the game area. Collecting the question mark calls up the Shadow, to which Shamus falls prey. In some rooms are barriers, which are an obstacle. Here Shamus needs to try to hit the item through one of the holes to be able to go on. The number of enemies takes on alarming proportions in the later course of the game. 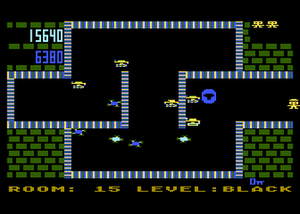 Shamus is a game from 1983, which can clearly be seen. The graphics are kept simple and functional and serve their purpose, the number of possible enemies that you face at a later point in the game is remarkable. One is quasi flooeded by enemies in the style of Gauntlet - this is respectable for such an early game, the more so as they are all animated. The wallpaper-like patterns of the unused screen area and the animated walls keep the rooms from a too big optical monotony. The intro by Synapse before the game is done extensively stylish regarding the time of creation, futuristic sounds and a glossy effect make it stand out of the masses of what was common at that time. The sound effects in the game fit the happening.... hissing shots and explosions, droning and electric strikes are realized convincingly... it "zaps" and "woooshes" everywhere. When a question mark is collected, several beats of "As time goes by" from the black and white classic "Casablanca" sound. As title melody, the "Marche funèbre d'une marionnette" ("Funeral March of a Marionette") by Charles Gounod was chosen, known amongst other from the crime series "Alfred Hitchcock presents" Video at YouTube . As soon as you have cleaned a room from the enemies, the speed of the character rises abruptly. Here you need to take care not to run into an electric wall by mistake. Only a maximum of two projectiles can be shown at a time, i.e. that missed shots on a long distance lead to lowered fire power. As nothing keeps you from leaving the room right after entering it and the number of enemies are decided randomly when entering a room, you can do this until an acceptable number of enemies is generated. On the other hand you also risk that the same coincidence causes an enemy to be created on the own player sprite. The version by WANDERER offers the possibility to switch off the collision with deadly objects and has a highscore saver. 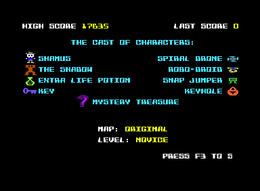 Robotron2084: "Shamus is without question a classic, but a classic, which was ruined by a murderous difficulty grade. One could probably get over this, but it is joined by noticeable weaknesses in the collision query, which make the own shots glide through the enemy without any effect while being in an especially precarious situation. But the own figure only needs to be hit at the tip of the hat and a life is gone. And it is also really annoying that one is placed right into an enemy when entering the room - happens seldom but often enough. And these things are just poor and very a shame, because otherwise Shamus is a really great Berzerk clone with nice ideas and enough own character. 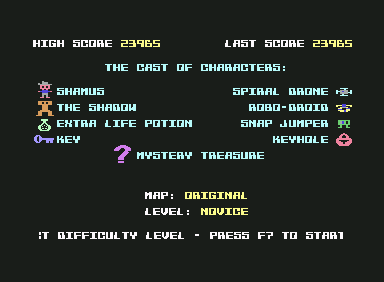 I always play Shamus although I know in advance that I will get incredibly upset about these really stupid bugs. Therefore only 6 out of 10 points." Synapse Software co-founder Ihor Wolosenko said in an interview, that his company made the long-awaited breakthrough with Shamus. 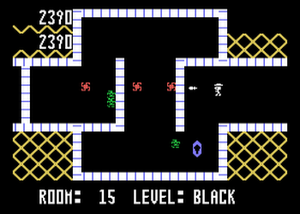 William Mataga's orignal version of the game resembled the arcade game "Berzerk" too much and they feared legal effects, so the game was expanded by a few elements to avoid problems. link to the interview. The Synapse intro at the beginning of Shamus was only used again by Slamball. "I played Apple II back in the day, and met the programmer, but don't recall the name. VIC20 was outsourced to some other company. It sold well, but we weren't crazy happy about the port." - Cathryn Mataga, Facebook conversation. 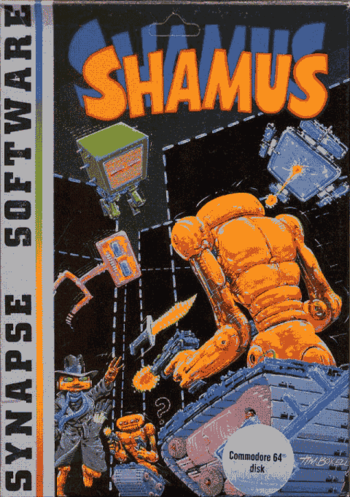 First, Shamus was published for the Atari 8-Bit, and then ported to many other systems. From left to right: (upper row) Atari 8-Bit, Apple 2, PC, (lower row) VC20, TI 99/4A, Tandy. Box cover of the version from 1983 by Synapse Software. Box cover of the version from 1986, which was re-released under the budget label "Americana" by U.S. Gold. This page was last modified on 26 October 2018, at 02:33.